The response from other faculty members was electric. Joan Watson, a liberal studies professor and later director of the Women’s Studies Program, observed: “The contributions of women have been hidden from history . . . women, like people of color, have been largely absent from the texts we study.” For many students, correcting that omission seemed to be both a revelation and a revolution. 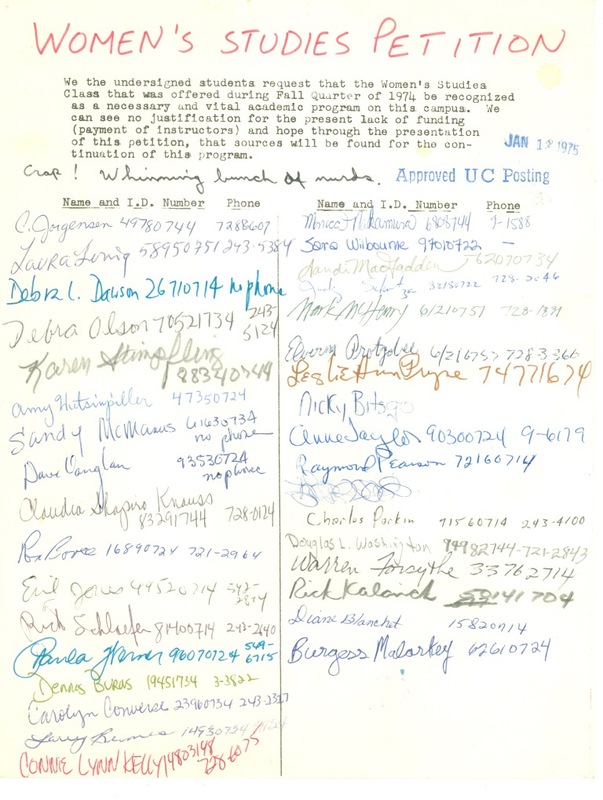 As early as 1975, students were petitioning to receive credit for informal classes offered through the program. Click on image to enlarge. Photo courtesy of the Diane Sands Papers (MSS 505), Archives and Special Collections, Maureen and Mike Mansfield Library, The University of Montana–Missoula. In addition to for-credit classes like “Women in American History” and a social work course titled “Liberation and Oppression of Women,” women’s studies faculty invited community women to offer nonacademic classes in home and auto repair. Taking their cue from consciousness-raising groups, which had become popular during the era, these classes often lacked the formalized teacher-student relationship and employed a more organic, egalitarian approach to learning. The “free-school” model operated out of a campus building that also housed the School of Social Work, the Black Student Union, and the Women’s Resource Center (where women could receive counseling for sexual assault and obtain other health-related resources). Over two hundred people in the Missoula community participated in these informal classes. To those active in the program, disseminating information proved more important than following university regulations. And campaigns to provide students with birth control information and abortion referrals met with backlash from university officials and provoked the ire of resident hall matrons, many of whom confiscated the materials wherever they were found. This questioning led to action, as students chafed against restrictive, discriminatory university policies. Female students, for example, answered not to the dean of students but to the dean of women, a distinction that subjected them to rules and regulations based on gender. For example, the university required women to live on campus until their senior year or until they were twenty-one, and residents of all-female dorms had to obey curfews or answer to a “standards board.” Behavior such as drinking or sneaking out could result in expulsion. The double standard proved infuriating to many women students, some of whom resisted the mandatory live-in policy by pitching tents on the dorm lawn. When Professor Wheeler first encouraged female faculty members to offer women’s studies courses within their disciplines, the goal was not to establish an independent department, but rather to create an informal alliance of teachers working together across departments. Still, as the field matured, and more professors began offering relevant courses, the goal changed. And yet, the Women’s Studies Program did not become a formal program until 1991, almost fifteen years after the National American Women’s Studies Association was founded. One reason for the long delay is that the program’s early efforts were as focused on activism as on academics. Once activists achieved some of their aims—such as an end to the dean of women’s position and to curfews for women students—classes became more formalized. Petitions to University of Montana administrators revealed a desire to earn traditional credits that could be counted toward graduation and a degree. By 2002, the Women’s Studies Program had become the Women and Gender Studies Program, offering an average of twenty-five different courses a semester, including “Introduction to Feminist Theory,” “Women and War,” and “Twentieth-Century Lesbian and Gay Fiction.” In 2014, the program was renamed Women’s, Gender, and Sexuality Studies. Students still cannot graduate with a degree in WGS, but the university does offer a liberal arts degree with an emphasis on women’s, gender, and sexuality studies, a minor, and a graduate certificate. Learn more about early Women’s Studies faculty member Judy Smith, whose classes, including “Feminism 101,” were open to all and was not on the university roster. Explore the Women, Gender, and Sexuality Studies programs at Montana State University, Bozeman, and at the University of Montana, Missoula. Sands, Diane. Sands interview by Erin Cunniff and G. G. Weix, December 15, 2000. Montana Feminist History Project, Oral History 378-02, University of Montana, Missoula. University of Montana Department of Women’s Studies Records. RG 087, University of Montana Archives and Special Collections, Missoula. http://nwda.orbiscascade.org/ark:/80444/xv04123. Wheeler, Carolyn. Wheeler interview by Diane Sands, March 10, 2001. Montana Feminist History Project, Oral History 378-30, University of Montana, Missoula. “Women’s Studies Explores Issues Ignored by Academics, History.” Montana Kaimin, January 29, 1992. “Women’s Studies Makes Its Mark.” Montana Kaimin, March 14, 1996. WGSS at UM now does offer a major! You CAN graduate with a degree in Women’s, Gender, and Sexuality Studies!